I’m already looking for things to keep the kids busy and entertained now that the weather is turning warmer so this 10ft Kids Inflatable Sea Animal Play Pool with Slide & Games caught my eye. 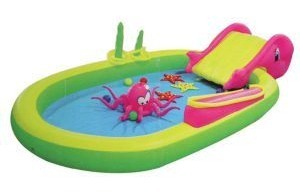 The kids are getting so big (and there are so freakin’ many of them) that we’re going to have to come up with something larger for them this year, but this sea animal pool is similar to the one they enjoyed the heck out of last year and it’s a great deal so I thought I’d pass it along. The pool retails for $65 but you can grab this one now for only $29.99 with FREE shipping!